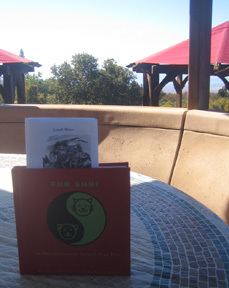 Back in LA...and Fur Shui now is in a LARGER size and paperback format. Visited Aum & Garden and enjoyed their Energy Expo! 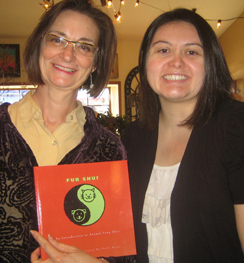 The book's red matches the vivid enthusiasm that Stanford (to my right) has for what she is doing for the folks at the Expo. Lots of "fame" energy to all who attended!!! Saying farewell to Maui and Napili Bay, with a flurry of clouds and some rain showers visible over on the island of Molokai. 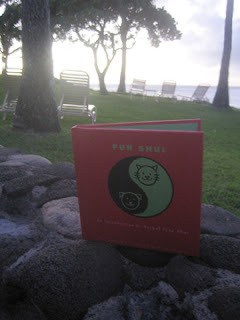 Fur Shui is re-charged to come home and be published in a larger fun format for its 2nd edition! 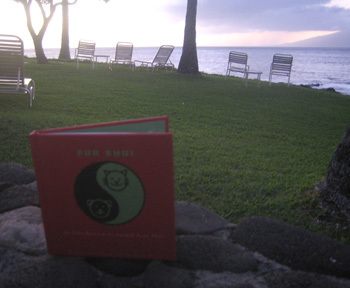 Success and good vibes from Maui, the island of "heart"...just like the unconditional love our pets give us everday. Aloha and Mahalo from Fur Shui to all who explore the magical energies of nature. Great lunch at Kula Lodge in Maui. Under the red shade umbrellas you can see out to the ocean for miles and miles. The "fire" element just above Kula is the Volcano, so the red umbrellas are appropriate for the fire influence, bringing fame to the name of Kula lodge. A great example of going along with the natural energies of one's environment. Just like fur folks, who naturally use what nature already has in place for us FREE of charge to bring balance and harmony to our lives. 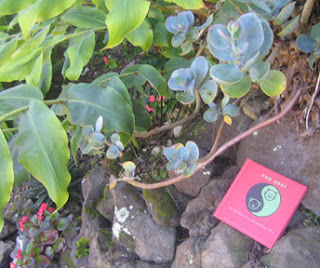 The book seems right at home snuggled in the gardens of ginger and lava stone...red and "fire"!